Fortunately, in many corners of the world, there are people and organizations out there that are willing to put forth their time, money, and effort into helping animals in need, especially after other animals or people have hurt them in some way. For one donkey in the United Kingdom, who is cutely named Eeyore, the kindness of others truly saved his life after one or more unknown assailants cruelly attacked him one early June night and cut his tail off. The wound was said to be so severe that some bone was exposed, with spinal fluid supposedly leaking from the wound as well. While the vets had initially believed they could sew the wound closed, upon closer inspection they realized the donkey required surgery. Before the wound could be sewn up for good, additional bone had to be taken out to allow the excess skin to be sewn. 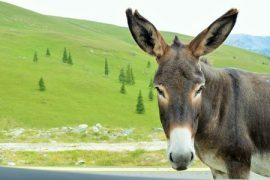 This process would leave the donkey with a cropped tail, similar to that of Dobermans or Boxers. After launching an appeal on its Facebook page, the Green Acres Rescue Center raised the required 1,000 pounds for Eeyore’s surgery within 24 hours. As well, BBC Wales printed Eeyore’s story, prompting even more donations from places as far away as Australia and the Netherlands. “We have wonderful supporters and are extremely grateful for their help,” Thomas said. In the meantime, before the operation, Eeyore’s wound was treated with Manuka honey dressings twice a day. “He has a wonderful temperament and has coped incredibly well with the ordeal,” Thomas said. The day after his successful surgery at the Cotts Equine Hospital on June 27th, Eeyore arrived back at Green Acres where he is recovering comfortably. The donkey’s prognosis is very good, and he should fully recover. The staff at the rescue center later thanked the many kind people who donated funds to help them get Eeyore well as well as the equine hospital that treated him. Question: I remember seeing a movie that someone used the honey to treat wounds in the skin, but first he boiled up. Is it necessary or I can use it at natural temperature?